Just thought I would let you know about a little PT session we had. We played Hoover Ball with a 12lb TKO medicine ball, 5 players per side, 6 games to 10 points. It took 55 minutes and everyone was wiped out. We found Hoover Ball when we were on the Internet looking for something more competitive and sporting for the medicine ball. It has a distinguished history , looked promising as a conditioning tool, and sounded fun so we suggested it on the WOD page and got the response above from Frank Ollis. We know Frank well enough to know that if he thinks it's tough, it's tough. The game is officially a game of catch played with a medicine ball under a volleyball net on a tennis court and with tennis scoring. Gotta give that a go. 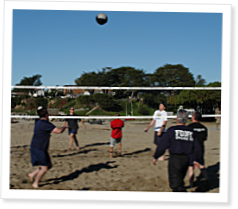 A group of paramedics from our service picked up a game of Hooverball a couple of weeks ago. We modified the rules a bit and played it using volleyball rules. We only had 9 player so we played oldest against youngest. (Youngest was 30ish, oldest was 53). The 4 "old" guys beat the 5 young guys 5 straight games to 11. By the end of the play, we were all dead tired. Great fun, I recommend it to anyone looking for a good workout. UNC's basketball team plays a very similar game called Danney Ball (no idea why its called that), but they play 2 on 2 with games to 11 using a 10lbs MB. They have a little special about it on their website, check it out. Its under special features, called "The Tar Heels play Danney Ball". Tyler Hansbrough is an absolute beast at it! Would love to see him try CrossFit!